Doug Collis (Left) shakes hand with Alex Johnston during the IARA awards ceremony at the 2014 Auto Remarketing Canada Conference. Photo by Michelle Yee. 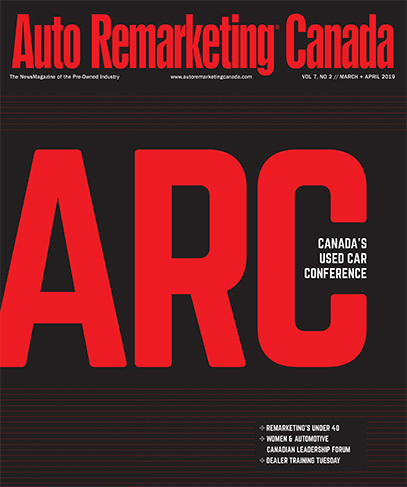 Awarded during a ceremony at the recent 2014 Auto Remarketing Canada conference, the International Automotive Remarketers’ Alliance (IARA) in Canada announced this morning the recipients of the Annual Remarketer of the Year and two Industry Icon Awards. This year’s Remarketer of the Year is Doug Collis, remarketing sales manager at Ford of Canada. The award is chosen by members of the IARA by a nomination process and is intended to recognize an individual who contributed to the awareness, the stature, and overall strength of remarketing as an aspect of the automotive industry, IARA officials explained. Collis has been with Ford since 1979 and held positions in various areas of the organization. Early in his career with Ford, Collis spent two years in Western Canada before returning to Ontario in 2000 to begin his career in “the world or remarketing,” IARA shared. The IARA extended honors to two other automotive industry veterans, as well, who were both awarded IARA’s Industry Icon awards. These Industry Icon awards are presented by the IARA to members who have made substantial contributions to the IARA and the remarketing industry at-large. Recipients of the IARA Industry Icon Award are Alex Johnston, of Hyundai Auto Canada; and Arnold Lee, from GM Financial. Johnston, remarketing manager at Hyundai Auto Canada, also oversees the company’s CPO business. Highlighting the exec’s background, Johnston began his career in the late 1960’s in automotive finance. He then worked at American Motors before leaving to co-found Trexar, a leasing company which served Honda Canada, among others. After a series of acquisitions Trexar became part of GE Capital where he was actively involved in their growth in the Canadian Market. “Johnston was also instrumental in HSBC’s success in the automotive finance business before moving to what was then Financialinx in 2005 and eventually moving to his current position at Hyundai,” IARA pointed out. Lee, GM Financial’s vice president of remarketing, oversees all aspects of GM Financial’s lease-end process, and he is also responsible for the remaining Financialinx vehicles in GM Financial’s portfolio. Lee had already begun his automotive career, having worked form British Motor Corp., when he emigrated from Ireland to Canada in 1967. After holding the position of vice president at two leasing firm, Lee joined Financialinx in 2002. “Known as a technology pioneer, Lee led the development of an online leased-vehicle return/upstream sales channel process which, while commonplace today, it was industry-leading when it was rolled out in the mid-1990s,” IARA officials sad. The IARA presented these awards at a ceremony on March 17 during the 2014 Auto Remarketing Canada Conference held in Toronto.